One of a Kind new construction GREEN home. 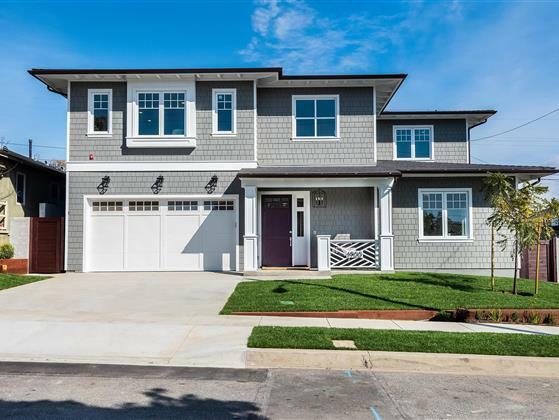 Over-sized corner lot, this gorgeous new home is appointed with photovoltaic solar panels, energy efficient appliances, A/C, LED lighting, and a tankless water heater. Pre-wired for a Tesla Powerwall Back Up System. Stunning kitchen with an over-sized center island. The kitchen offers quartz counters, walk-in pantry, stainless steel appliances including a German Liebherr refrigerator, Bosch dishwasher, and an Italian Bertazzoni 6-Burner stove. Beautiful, open floor plan with a fabulous GREAT ROOM featuring La Cantina doors that open out to a large grass (real grass) backyard. Don't miss the detached GUEST HOUSE - perfect for guests or a home office. Spacious main floor en-suite bedroom plus four more bedrooms upstairs along with an additional loft/study area. Additional upgrades including dual-zoned A/C, skylights, hardwood flooring, 10' ceilings, pre-wired for security surveillance and surround sound. Great family neighborhood.